Wedding bells are ringing--and a widowed mother of two hopes the occasion will reunite her daughters in this captivating novel from the New York Times bestselling author of The Island House and Secrets in Summer. A few years after losing her beloved husband, Alison is doing something she never thought she would do again: getting married. While placing the finishing touches on her summer nuptials, Alison is anxious to introduce her fianc , David, to her grown daughters: Felicity, a worried married mother of two, and Jane, also married but focused on her career. The sisters have a somewhat distant relationship and Alison hopes that the wedding and the weeks leading up to the ceremony will give the siblings a chance to reconnect, as well as meet and get to know David's grown children. As the summer progresses, it is anything but smooth sailing. Felicity stumbles upon a terrible secret that could shatter her carefully cultivated world. Jane finds herself under the spell of her soon-to-be stepbrother, Ethan, who is as charming as he is mysterious. And even Alison is surprised (and slightly alarmed) by her new blended family. Revelations, intrigue, resentments--as the Big Day approaches, will the promise of bliss be a bust? 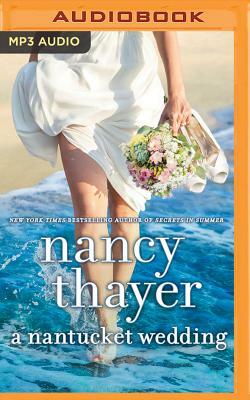 Against the gorgeous backdrop of the sunswept island of Nantucket, Nancy Thayer sets the stage for a walk down the aisle no one will ever forget.